I downloaded the Windows 8 Developer Preview the first evening that Microsoft made it available to the public. I had watched the BUILD keynote during the first day of the conference on September 14, 2011, and I was impressed with most of what Microsoft has done on the developer platform for their new OS. 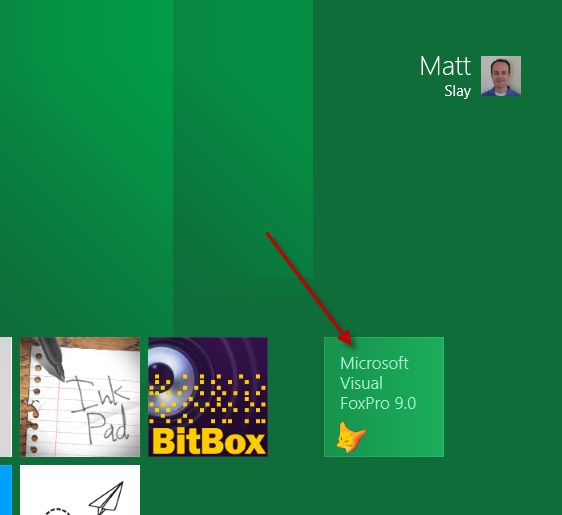 So, sure, Windows 8 looks all cool and I am sure we’ll all have some fun building these new “Metro” style apps for it. I’m looking forward to it, just as I’ve looked forward to every new programming journey I’ve tackled lately, like learning C#, WPF, ASP.Net MVC, and Ruby on Rails. I love it all. Bring on more! According to http://fox.wikis.com/wc.dll?Wiki~CurrentVersion~SoftwareEng , the latest, fully patched version of Visual FoxPro 9 is 09.00.0000.7423. 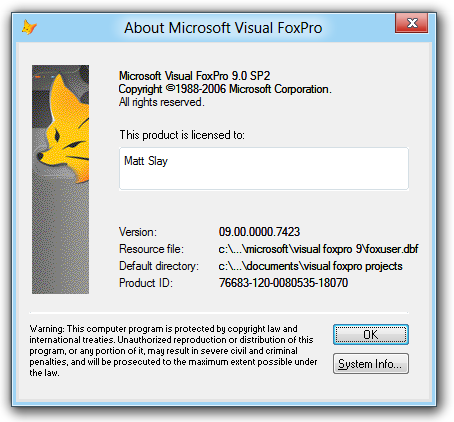 So, the answer is YES, Visual FoxPro 9 SP2 works in Windows 8. Now, I’m just waiting for the release of the “Metro for FoxPro” framework on VFPx. Anyone?